If you’re kicking off your shoes this summer, make them a pair of these cruelty-free espadrilles. A collaboration between People for the Ethical Treatment of Animals and “footwear with a purpose” brand M4D3, the Mediterranean-style flats feature sleek faux leather, jute-rope soles, and both the M4D3 and PETA logos on its tag, inner sole, and back. We’re giving away a set of these slip-ons in the winner’s choice of size (5 to 11, half sizes included) and color (black, white, or blue). Can’t wait to see if Lady Luck is on your side? Take a whopping 50 percent off when you buy a pair of these shoes right now at shop.m4d3shoes.com with the code M4D3XECOUTERRE. 2. LEAVE A COMMENT BY AUGUST 18 and tell us what cruelty-free changes you’ve made—or are making—to your lifestyle. Although it doesn’t hurt to get fancy, we’ll be picking a winner at random. We’ll announce the winner in our newsletter on Wednesday, August 19 The deadline to enter is 12 midnight ET on Tuesday, August 18, so ENTER NOW for a chance to win! People for the Ethical Treatment of Animals is the largest animal rights organization in the world, with more than 3 million members and supporters. PETA focuses its attention on the four areas in which the largest numbers of animals suffer the most intensely for the longest periods of time: on factory farms, in the clothing trade, in laboratories, and in the entertainment industry. It also works on a variety of other issues, including the cruel killing of beavers, birds, and other “pests,” as well as cruelty to domesticated animals. M4D3 (Make A Difference Everyday) is a social enterprise creating product with a purpose. It partners with impactful personalities, artists, and aid organizations to raise funds and help create social change. Originally published on August 6, 2015. Becoming vegetarian was the first step towards a more cruelty-free life. Becoming a vegan was the next one. And now trying to be vegan in every aspect of my life, caring about the products that I use, the clothes that I buy, trying to fight for animal rights and to convince people to stop eating meat. I've been vegan and "clean and green" for a long time, but one change that was terrific was buying a laundry pod. It's so much easier than "old fashioned" hand washing, and keeps my sustainable clothing in great shape, paired with soap nuts, etc. I choose not to purchase animal-tested cosmetics, I am also a vegan, and while I don't push my lifestyle onto others, I do show them that cruelty- free options can rock! I don't use makeup anymore, and if I do, I only use plant base or mineral based makeup. This also includes any other beauty product. I do not use leather either. Recycling and picking up trash is the way I keep the environment green. I also wash my hair once or twice a week, so the natural oils shine through. Not eating meat and only using cruelty-free products whenever possible! Ethical vegan -- since 2006. I use Lush cosmetics, a company with a strong stance against animal testing. I am only buying cruelty free products. And I definitely shy away from anything that isn't faux fur. thnx! I try to be cruelty-free as much as possible in all aspects of life. I am a vegetarian and I try to be vegan a few days a week.I don't but anything tested an animals and I don't wear anything made from an animal. No fur and no animal-testing products. Trying to persuade people to do the same things. I've been vegan for 4 years, and apart from having to still explain myself, they've been the best years of my life. I don't use cosmetics and avoid plastic products. It's so interesting that the cruelty-free/green version of life coincides with the healthy version of life. More people should try, even simply out of selfishness. I subscribe to the newsletter. I only buy makeup and body products that are never tested on animals. 4 years ago I turned Vegetarian. Since then I have been living as green and eco-friendly lifestyle as possible. I write a blog that promotes green ideas and innovations. Here is the link: www.ecoschmico.wordpress.com. In Nov 2015, myself and my girlfriend will be moving to Latvia to start our own organic farm and eco-tourism venture. I am a vegetarian for 10 years. I try to be aware of my shopping habits and i try to eat more organic products. I buy cosmetics only from cruelty free companys. These are gorgeous and I love them. I've been vegan for 10 years in September and am directly responsible for at least 4 people turning vegan, and at least a dozen turning vegetarian. I never force people, I set an example and entice them with delicious amazing treats that I bake very often. I also work at a primarily vegan green design company and own my own vegan sewing business of crafting custom dog coats and other waterproof softgoods from repurposed, rescued broken umbrellas from all over the world, its called Recycling Zychal. My life revolves around my sustainable lifestyle. I couldn't imagine my life any other way. I live my platform of "Health, Social and Environmental Consciousness" by eating a vegan and plant-based diet, living a zero-waste and plastic free lifestyle, practicing minimalism, making all my own makeup and products, and only purchasing things that are recycled, fair trade, made in the USA, cruelty free, and local business. I love cooking my own meals because I know exactly what's going in them. I've been researching more vegetarian options and trying to incorporate them into my cooking. I finally made the move to become completely vegetarian. My son's girlfriend is vegan and so we've all become a lot more conscious of our lifestyle. We're trying to make some positive changes, including food choices. Personally, I'm trying to be more cognizant of the beauty products that I buy. 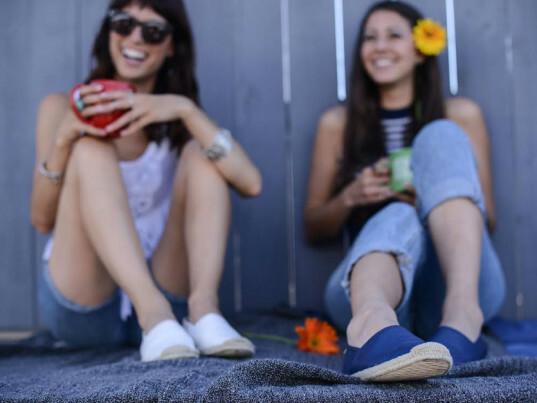 If you're kicking off your shoes this summer, make them a pair of these cruelty-free espadrilles. 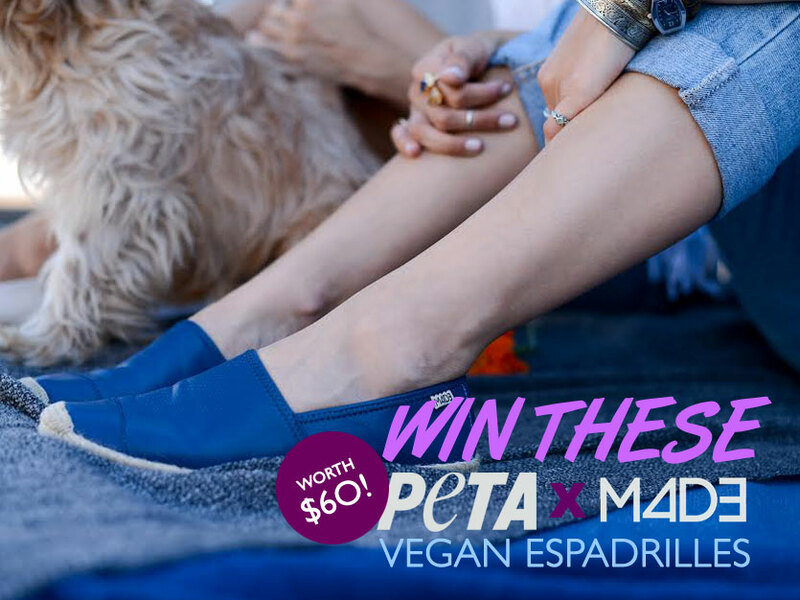 A collaboration between People for the Ethical Treatment of Animals and "footwear with a purpose" brand M4D3, the Mediterranean-style flats feature sleek faux leather, jute-rope soles, and both the M4D3 and PETA logos on its tag, inner sole, and back. We're giving away a set of these slip-ons in the winner's choice of size (5 to 11, half sizes included) and color (black, white, or blue).